The main objective of the conference is to enable the circles representing both countries to get to know each other and to present current developments in the area of woman and gender studies. The panels and presentations are to focus on what is characteristic and particularly problematic in a given country and on the main thrust of research and how it is being conducted. Emphasising the issues of what is Jewish and what is Polish and how they interpenetrate in Israel and in Poland, the organisers believe that this is most interesting for participants of the conference. Malgorzata Fuszara– sociologist and lawyer specialising in the sociology of politics and law, culture and gender studies. Professor at Warsaw University. Agnieszka Graff- writer, translator and journalist, associated with the feminist movement. She teaches at the American Studies Program at Warsaw University. Monika Platek– lawyer specialised criminology law, she deals with the legal issues from the feministic perspective. Professor of Warsaw University and co-founder of Gender Studies Program at the Polish Academy of Sciences. MagdalenaSroda- philosopher, journalist, she deals with the history of ideas, ethics, political philosophy and feminist. Professor of Warsaw University. She was also Minister for Equal Status of Women and Men. Kazimiera Szczuka- history of literature specialist and literary critic, a TV journalist and founder of "Women 8 March Agreement" which organises the Warsaw feminist demonstrations 'Manifa'. Bozena Uminska- journalist, translator, poet and scholar of literature. She works at the Jewish Historical Institute of Emanuel Ringelblum in Warsaw. Hanna Herzog (Tel Aviv University), Orly Lubin (Tel Aviv University), TamarRapoport (Hebrew University, Jerusalem), Niza Yanay (Ben Gurion University), Yael Hazan, (Ben Guion University), Hanna Naveh (Tel Aviv University), Miri Rozmarin (Tel Aviv University), Orna Donath (Tel Aviv University), Amalia Ziv(Ben Gurion University), Nurit Yirmiya (Hebrew University, Jerusalem), Adriana Kemp(Tel Aviv University), Ronit Irshai (Bar Ilan University), Orna Sasson-Levy (Bar-Ilan University), Naomi Graetz (Ben Gurion University), Daphna Hacker (Tel Aviv University). Agnieszka Graff (Warsaw University): National struggle, women's struggle. Polish feminism and the eternal priority of the “national” issue. OrlyLubin (Tel Aviv University): Feminism and Israeli-Jewish Nationalism. Tamar Rapoport (Hebrew University): Russian Immigrants don’t feel they belong to Israel. Bo_ena Keff (Jewish Historical Institute, Warsaw): Author's commentary on her poem “On Mother and Fatherland. Yael Hazan (Ben Guion University): Following Traces: Women Writing on Torture. Hanna Naveh (Tel Aviv University): The Long Grey Line: A Woman's Perspective. Daphna Hacker (Tel Aviv University): Gender Inequality in the Rabbinical Courts. Monika Płatek (Warsaw University): Taking equality seriously. Gender approach to legal status of woman in Poland. Magdalena Sroda (Warsaw University): “Abortion” - about the problems of power (authority) and language in Poland. Ido Shahar (Hebrew University and Ben Gurion University): Forum shopping between civil and shari‘a courts: Maintenance suits in contemporary Jerusalem. Małgorzata Fuszara (Warsaw University): Women as political actors in Poland. Adriana Kemp (Tel Aviv University) and Nitza Berkovitch (Ben Gurion, University): Financial citizenship. Ronit Irshai (Bar Ilan University): To be an Orthodox Jew and a feminist: Some paradoxes and solutions. Orna Sasson-Levy (Bar-Ilan University), Yagil Levy, (The Open University of Israel), Edna Lomsky-Feder, (Hebrew University): "Women Breaking the Silence": Military Service, Gender and Antiwar Protest. Kazimiera Szczuka (The Polish Academy of Sciences, Warsaw): Polish mother – the prisoner of the national community. Miri Rozmarin (Tel Aviv University): Maternal narratives, maternal silence. Orna Donath (Tel Aviv University): What is 'Family' Anyway? Definitions and Alternative Social Ties from the Online Forum "Women who don't want children". Amalia Ziv (Ben Gurion University): Israeli Familialism and Queer Reproduction. 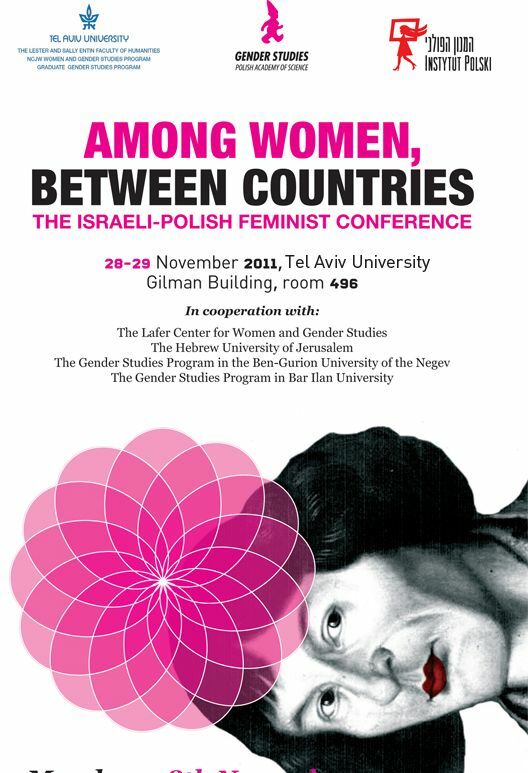 The conference is organized by the Tel Aviv University in co-operation with the Lafer Centter for Women and Gender Studies, the Hebrew University of Jerusalem, the Gender Studies Program in the Ben-Gurion University of the Negev, the Gender Studies Program in Bar Ilan University and the Polish Institute in Israel. "Among Women, Between Countries" The Israeli-Polish Conference on Feminism takes place on the 28-29th of November 2011, at the Tel Aviv University.